I just released version 3.3 of Chess for Android, available at Google Play or as direct download. The new features include: Ability to modify filenames of regular and tournament games.Information on network status during socket setup. In the older versions, regular games and tournament games were alway appended to, respectively, the files games.pgn and tour.pgn on SD card. The new feature allows users to change these defaults through a "Change pathnames" menu. The pathnames can even include subdirectories, provides these directories exist. The second feature displays information on the network status during socket setup (mobile connection, Wifi, etc.). In the version without network permissions (the default on Google Play), a proper warning message is shown instead. Below a more detailed view of all monitoring stations in the Bay Area that are part of the radiation network, where my station shows in slightly darker yellow. The station near LLNL usually shows a similar CPM rating, while the one in the South Bay usually shows a bit higher CPM. As long as my station is up, you can also view this real-time map. I purchased GeigerGraph for Networks from Mineralab, and joined the radiation network, which is a network of volunteers all over the world with radiation monitoring stations that report local CPM (counts per minute) ratings. In the graph below, you can see my station in the East Bay in slightly darker yellow. I can highly recommend this software. The maps show active monitoring stations all over the world, and one can obtain more detailed information for each station. The software also generates graphs or spreadsheets of measured data, and allows specifying alert actions, such as sending an email, when CPM ratings exceed a certain maximum. The software can also post a real-time map on a server. I investigated the large variation observed in the graph of June 6. While babysitting the monitoring software, I noticed that occasionally the software would report bursts of over 200 CPM, even though the Geiger counter itself never measured such a spike. Two "faulty minutes" in one hour could easily explain the 400 clicks variation. Therefore, I first tried different serial/USB converters (settings were always as specified by the GC manufacturer), since low quality converters are notorious for messing up signals. But I noticed faulty burst even for expensive converters. Then I tried my only computer that still has a serial port. Now, no more faulty bursts occurred during several test runs. After that, I redid the 24 hours experiment. The results are shown below. A much more stable graph, reporting around 700 CPH, or .1 μSv/hour, which translates into about .9 mSv/year. I got a Digital Geiger Counter for my birthday (yes, I know, geeky). 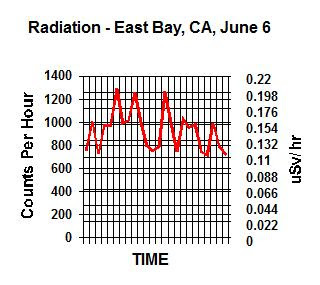 As a starter use, I measured the background radiation in our house in the East Bay over the past 24 hours. The results appear in the graph below, plotting the "counts per hour" and correspondingμSv/hour over the past 24 hours. The worst-case measured .2 μSv/hour translates to about 1.8 mSv/year, which luckily seems a bit below the worldwide average background dose.